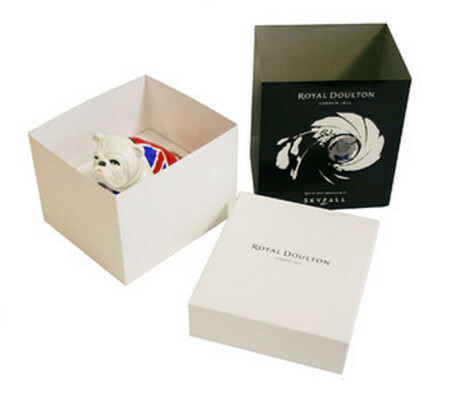 One of the unlikely stars of Skyfall is the porcelain bulldog seen on M’s desk, which is later bequeathed to 007. The figurine is produced by Royal Dalton from a 1941 design by the company’s then Art Director, Charles Noke, in the year that he died. 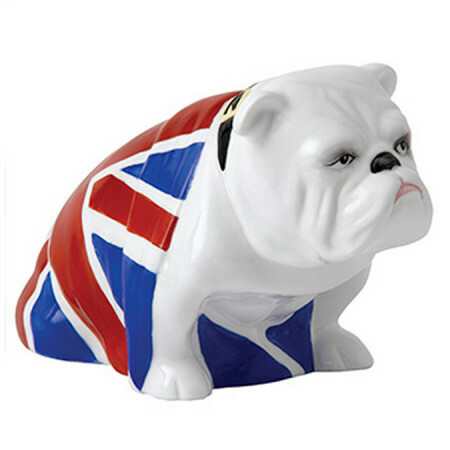 Of the three bulldog statuettes produced by Royal Dalton, the one featured in Skyfall is decorated with a Union flag and called “Jack” – the others are “Patch” and “Alfie”. The bulldog has been associated with British stoicism since the nineteenth century but became particularly popular during the Second World War, thanks to Winston Churchill’s resemblance to the breed. Screenwriter John Logan recently spoke about the use of metaphors in film where abstraction is difficult and how he used the bulldog as a metaphor for M.
The Skyfall bulldog figurine has been hugely popular since appearing in the film and has quickly sold out after new production runs. Royal Dalton is due to release a new batch shortly, but it is unknown whether any further production runs will take place in the future. Bulldog Jack comes in a Skyfall presentation box and is stamped underneath with the identifier DD007 ensuring they will remain popular with collectors.